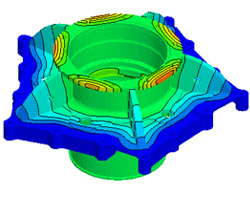 The VfsTools library from Visual Kinematics, Inc. is an object-based software development toolkit designed to enable the solution of the systems of equations which typically occur in finite element simulations. VfsTools enables programmers to manage global system degrees of freedom, assemble and solve linear systems and compute eigenvalues and eigenvectors for large linear systems. Global degree of freedom management. Matrix assembly in sparse, full or diagonal formats. Solution of large linear systems of equations. Compute the generalized eigenvalue problem for large linear systems. Perform general Ritz reductions of system matrices. Solution executives to guide generally non-linear solution procedures. Extensive Level 3 BLAS optimization.